Kenya Kiōng-hô-kok (Eng-gí: Republic of Kenya) tiàm-tī Hui-chiu tang-pō·. Keh-piah kok pau-koah Ethiopia (pak), Somalia (tang), Tanzania (lâm), Uganda (sai), Sudan (sai-lâm). Tang-lâm kak chiap Ìn-tō͘-iûⁿ. ↑ 1.0 1.1 Constitution (2009) Art. 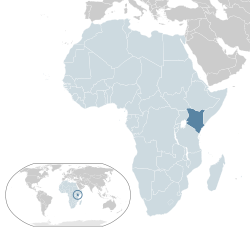 7 [National, official and other languages] "(1) The national language of the Republic is Kiswahili. (2) The official languages of the Republic are Kiswahili and English. (3) The State shall–-–- (a) promote and protect the diversity of language of the people of Kenya; and (b) promote the development and use of indigenous languages, Kenyan Sign language, Braille and other communication formats and technologies accessible to persons with disabilities." ↑ countrymeters.info. 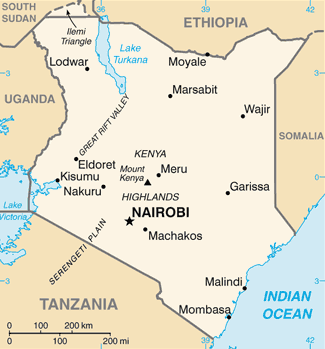 "Kenya population 2017 - Current population of Kenya". ↑ "Kenya 2009 Population and housing census highlights" (PDF). goân-loē-iông (PDF) tī 10 August 2013 hőng khó͘-pih. 22 May 2011 khòaⁿ--ê. Unknown parameter |df= ignored (help). www.knbs.or.ke. ↑ 4.0 4.1 4.2 4.3 "Report for Selected Countries and Subjects (valuation of Kenya GDP)". International Monetary Fund. Chit ia̍h siāng bóe tī 2017-nî 12-goe̍h 3-ji̍t (Lé-pài), 08:15 ū pian-chi̍p--koè.